Two rare books with shipwreck provenance go to auction By Nate Pedersen Nate Pedersen is a librarian and writer in Oregon. He is the co-author of Quackery: A Brief History of the Worst Ways to Cure Everything (Workman, 2017). Everything wore the silence of the tomb. Finally reaching the cabin door they broke in, and found their way in the darkness to the table. On it they accidentally turned on a box of lucifer matches; in a moment one was ignited, the glowing light revealed a candle; it was lit and before the astonished gaze of these men exposed a scene that appeared to be rather one of enchantment than reality. Upon a massive table was a metal teapot, glistening as if new, also a large volume of Scott’s family Bible, together with glasses and decanters filled with choice liquors. Described as a “poignant artifact from an important Franklin Search expedition,” this copy of Voyages in the Arctic Seas (1831) was found aboard the abandoned but intact HMS Resolute in 1855. It is estimated to make $2,000–3,000 at Christie’s in December. Courtesy of Christie’s. 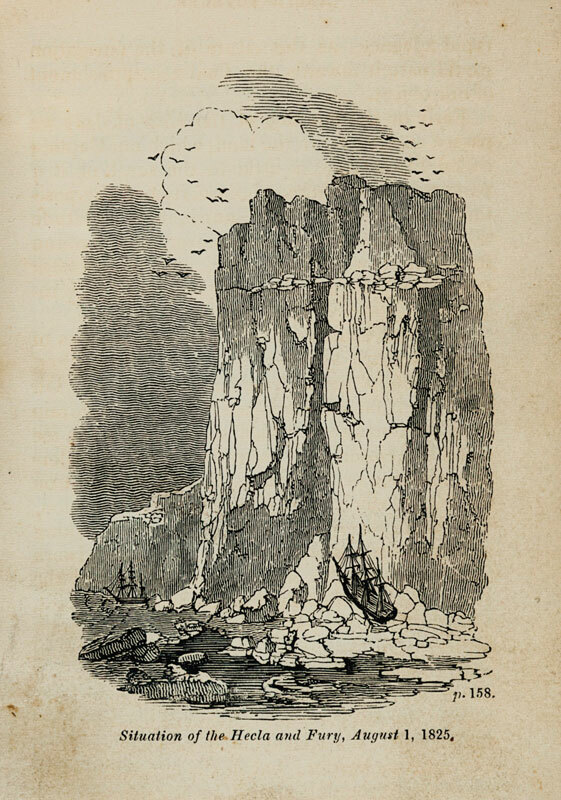 An illustration from Voyages in the Arctic Seas (1831). Courtesy of Christie’s. Talk about sunken treasure! 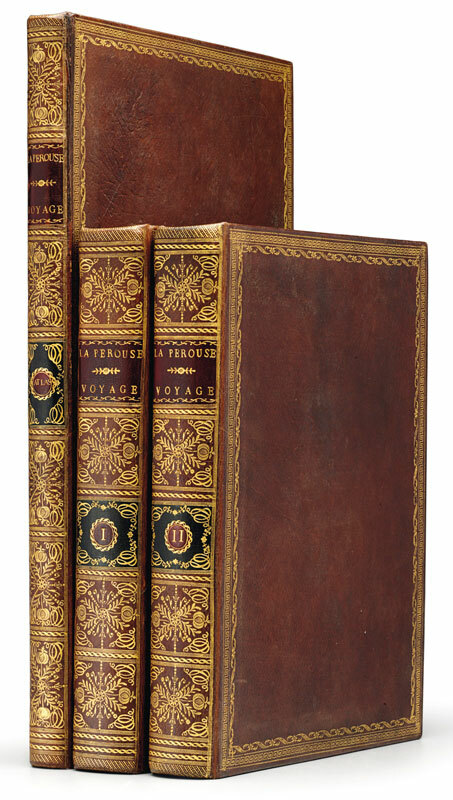 The copy of La Pérouse’s A Voyage round the World (1799) from Martin Greene’s library is bound in leather salvaged from a two-hundred-year-old shipwreck. It goes to auction in New York on December 7, estimated at $10,000–15,000. Courtesy of Christie’s. The abandoned ship was the HMS Resolute, which had departed England three years earlier in an unsuccessful attempt to locate the missing Franklin expedition. Captained by Sir Edward Belcher, the Resolute was vacated by its crew in April 1854, eight months after it had become stuck in the floe ice. Its crew marched across the ice to join other ships in the expedition. The Resolute, meanwhile, slowly drifted with the ice, traveling 1,200 miles from where it was initially deserted to the place where the George Henry crew spied it the following year. The Resolute was remarkably intact—in fact, history buffs may recall that a desk made from its recycled oak timbers was given to President Rutherford B. Hayes from Queen Victoria and still resides in the Oval Office. 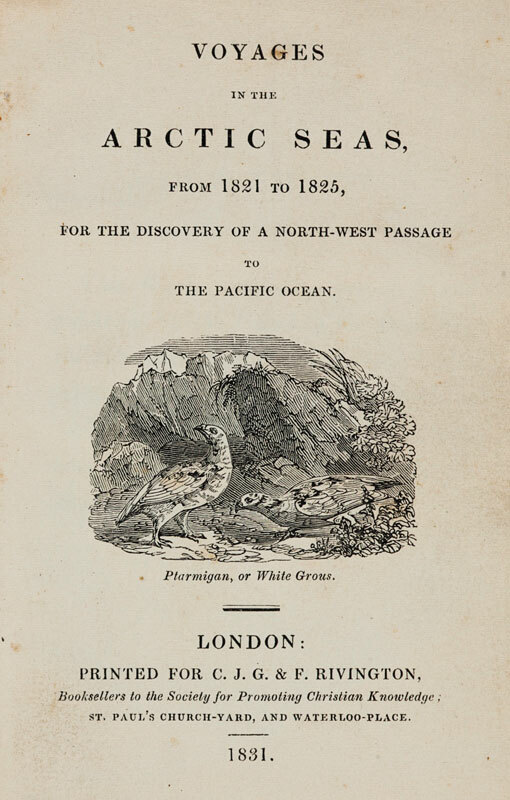 The ship’s library included a copy of Voyages in the Arctic Seas, from 1821 to 1825 … (London: 1831), which is now headed to auction as part of the Martin Greene library at Christie’s. Greene’s collection, containing a significant number of polar exploration high spots, will be offered for sale in New York on December 7. One such artifact of continuing discovery is a copy of La Pérouse’s A Voyage round the World (1799), once a part of Princess Sophia’s library. The book was subsequently rebound in eighteenth-century Russia leather recovered from the wreck of the Metta Catherina, a brigantine that sunk off Plymouth Sound in 1786. When the ship was discovered by divers in 1973, the bulk of its leather cargo was remarkably well preserved, surviving nearly two centuries underwater by having been rolled by its crew into extremely tight bundles. The antique leather has since been used in a variety of restoration projects, including bookbinding. Nate Pedersen is a librarian and writer in Oregon. He is the co-author of Quackery: A Brief History of the Worst Ways to Cure Everything (Workman, 2017).